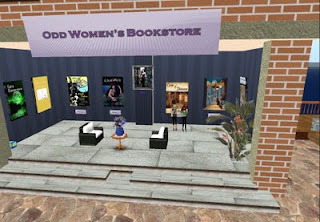 Sometimes I’m able to convince authors to explore the creativity and opportunities of Second Life. Numerous efforts have led me to introduce the virtual world to authors Robert Dugoni, Karen Kay, Donna Fletcher Crow and two women that I met at my AuthorFest in IL, Sarah Glenn and Gwen Mayo. This article will be devoted to Sarah, first. So we sit at my Italian table on my SL home’s patio on a Wednesday night. The three of us enjoy a quiet moment of no IMs. The first discussion is about Sarah's real life writing experiences. Sarah began writing in her youth. She focused on stories about horses and drew them. Years later, she graduated to X-men and the horror genre, first writing fan fiction. "I wanted to be a writer my entire life," she confesses in voice. "In my novel, 'All This and Family, Too,' extraordinary people are in very ordinary circumstances. Cynthia Leach is an astronomer who likes going out and using a telescope in the woods. She's extremely upright and heroic. Penelope was her sire." At this point you should get the idea that we're discussing a paranormal and Sarah is writing about vampires. She tells me that Penelope has been destroyed and does not appear as an active character. Cynthia does have a mentor and friend. Dylan Duvoth was born into a wealthy family in Great Britain. He wanted to be a movie star, so he set out for California. Pill Hill Press in Nebraska published the book in May. Sarah’s currently working on a sequel to the book, possibly a family saga. Thanks for visiting our store and writing such a nice article! ROBLOX is driven by an ever growing player base of over 300,000 creators who produce an infinite variety of highly immersive experiences. These experiences range from 3D multi-player games and competitions, to interactive adventures where players can take on new identities exploring what it would be like to be a dinosaur, a miner in a quarry or an astronaut on a space exploration.